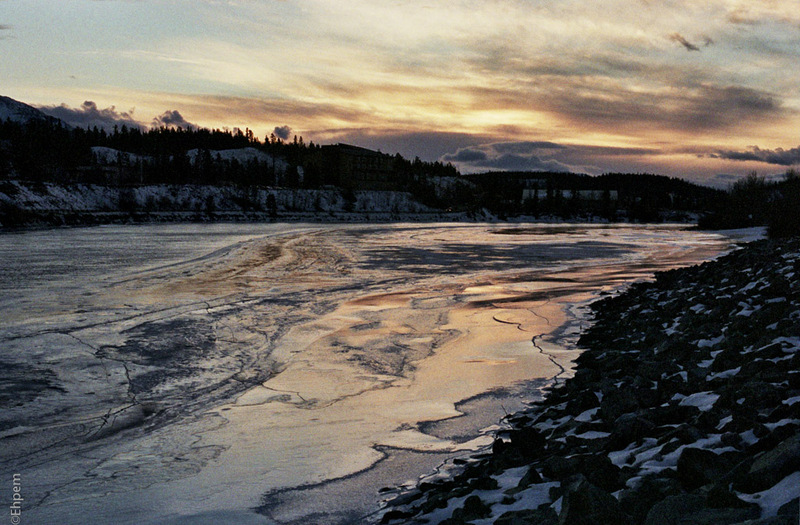 Yukon River in Whitehorse, Yukon Territory. This shot was made at sunrise (10 am) but the sun did not get much higher than this before setting mid-afternoon (4 pm). We spent last weekend in the Yukon, attending and speaking at a book launch for a book I co-edited. I also authored a few chapters as did my wife and many others so we were invited to the Yukon launch of the book in Haines Junction. It was great to catch up with nearly 20 year friends that arose from this the Kwädąy Dän Ts’ìnchį project. That sounds very rewarding, congrats – but getting up that early and getting out in what must be some serious cold – wow, impressive. Worth it, too! Hi Lynn, I wish I could take credit as the rugged early rising well insulated photographer that you imply. But, sun came up mid-morning so we woke in the dark and it stayed that way until 10. And the weather, while we were there, was breaking 1904 records for the warmest days. It was, in fact, warmer in Whitehorse when we landed than it had been in Vancouver when we took off a couple of hours earlier. Now, the downside was that is was extremely slippery – many roads and highways were closed and sidewalks were beyond treacherous, so I guess we did have some hardships. I didn’t actually hit the pavement/ice but it was a close thing many times. While we were in Haines Junction a guy fell on the ice in a parking lot. It was so slippery he could not get back up, and could not crawl to snowy edge. A guy with studs on his boots had to help him. 🙂 Good thing Mr. Stud was there! That reminds me of being let off at my house by the school bus as a child one very icy, snowy day in Syracuse, NY, and literally crawling up the hill to the front door on my stomach. I couldn’t walk, it was so slippery. A while back, in snowy Connecticut, I was running on snow and slipped on invisible ice under the snow, breaking my sacrum. Pretty painful! Yikes! When I was little we lived in Edmonton, that was before climate change, and when school was uphill in both directions. Usually not slippery, but I did keep on sticking my tongue to things. Getting loose can be pretty painful, but not the way a broken sacrum would be. Thawing out after too long playing outdoors are among my most painful childhood memories. Thank you Emily. The light, what there is of it, can be absolutely wonderful at this time of year.